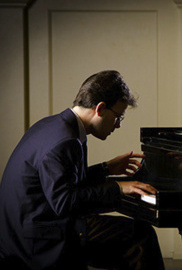 An official selection of the prestigious 2013 American Documentary Film Festival, The Sudden Pianist is an intimate portrait; a film exploring composer Michael Hersch's music for the piano and his performances of it. Widely considered “one of the most fertile musical minds to emerge in the U.S. over the past generation&quot; (The Financial Times), the documentary sheds light on this aspect of Hersch's music-making with never before seen or heard footage of the composer performing - from his debut to the present day. There are also rare interviews throughout. The film is a moving journey into the mind of one of America's unique artists. The documentary is immediately followed by Hersch's first appearance as a pianist in New York City in over a decade, performing selections from his acclaimed work, The Vanishing Pavilions.